Nordic Crime Bibliography compiled by James M. Kaplan Ph.D.
Swedish fiction has been translated into a wide variety of languages. It is primarily crime fiction, however, that has aroused international interest because it has “maintained a classic tradition in Swedish literature based on a critical appraisal of contemporary society” (sweden.se). John Crace argues that Scandinavians produce “great plotlines that are as cold and bleak as the locations in which they are set. It’s this sense of the other that sets them apart… The Scandinavian locations dislocate… readers and help take them beyond plot and genre to the human condition.” In Swedish crime fiction, there is a “pervasive, collective sense of disillusionment coming from… the bitterness of the past, and cynicism of the future, caught up in the bleakness of the landscape” (Steven Peacock). These qualities were present in Swedish crime fiction from the very outset. This brief article focuses on some of the lesser known novels that are in danger of being forgotten because most are only available in Swedish and have been overshadowed by Stieg Larsson, Camilla Läckberg and Liza Marklund. While Kerstin Bergman and Sara Kärrholm regard Fredrick Linholm’s Stockholms-detektiven (The Stockholm Detective, 1893) as the first Swedish detective novel because it is the first to feature “a coherent story centring on a crime and its solution,” Sjömans-Hustrun: Sann händelse (The mariner’s wife: a true story) by F.L.R. (no name is given) demonstrates similar qualities nearly sixty years earlier. Published in 1837, this intriguing novel is based on a true story and describes the investigation of an apparent suicide case. One year later, Carl Jonas Love Almqvist published Skällnora qvarn (Skällnora mill) set in central Sweden. This short novel centres on family intrigues. Packed with tension to the very end, it is well-written and a challenge to the reader’s powers of observation and deduction. In the second half of the 19th century Swedish writers began to turn their attention to the U.S.A., even if the focus remained on Swedish settings. John Moore is a case in point. His two novels, Sju dagar och sju natter—ur en detektivs anteckningar (Seven days and nights—from the detective’s notebook, 1888) and Diamantstölden—ur en detektivs notebook 2 (Diamond theft—from the detective’s notebook 2, 1889) are set in New York and Chicago respectively. Both stories, especially the first, are packed with surprises. 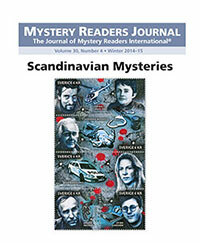 Sju dagar och sju natter is probably Sweden’s first whodunit and is still a good read. Samuel August Duse was one of the most productive writers of this period. His fourteen detective novels, published between 1913 and 1928, focus on Leo Carring, a private detective inspired by Sherlock Holmes. His debut novel, Stilettkäppen (The sword-stick,1913) is perhaps the strongest in the series. Duse’s novels are characterised by upper-class values as well as racism, particularly in Antisemiten (The anti-Semite, 1921). A new era in Swedish detective novels began in the 1940s with Stieg Trenter. Focusing on Stockholm, Trenter’s novels feature Harry Friberg, a photographer and detective who works closely with superintendent Vesper Johnson. Two of the best known of Trenter’s novels are I dag röd (Today red, 1945) and Aldrig Näcken (Never Näcken—the evil spirit of the water, 1953). Another serial writer is Maria Lang, who published more than forty detective novels between 1949 and 1958. Lang was the first Swedish female detective writer to become popular in Sweden and was read most in the 1950s. While at least one of her novels was always on the Swedish best-seller list up to the 1970s, she is less well-known today. Lang’s novels combine crime and romance, focusing on human relations and the psychological background to murder. She was the first of the Swedish detective writers to give love and sexuality a key role in her novels. Like Duse, her debut novel, Mördaren ljuger inte ensam (The murderer is not the only liar, 1949) is one of her strongest. While the 1960s and ’70s saw the emergence of police novels by the duo Maj Sjöwall and Per Wahlöö, other less well-known authors also made their debut at this time. Among these is Jan Mårtensson, a diplomat, most of whose series of over fifty detective novels focuses on an antique dealer in Stockholm, Johan Homan. The series is unusual in that it focuses on art, design and literature and is aimed at the educated reader. Mårtensson’s most recent novel is Den grekiska hjälmen (The Greek helmet, 2013). The realistic and socially critical police novel tradition begun in the ’60s and ’70s has been followed by Åke Edwardsson and Arne Dahl (pseudonym Jan Arnald). Dahl’s novels are set in Stockholm and follow the so-called “A group” of policemen who investigate crimes with international connections. The descriptions of present-day Stockholm are accurate and convincing. Today, however, Swedish writers are moving away from Stockholm to the countryside, Henning Mankell being one of the best known examples. The focus is also increasingly on the family and the individual rather than on social critique. It is unclear how this trend will develop but the focus on the human condition seems likely to remain strong. Swedish detective fiction has a long and rich tradition that is only just beginning to attract the interest of critics (most notably Peacock, and Bergman and Kärrholm). The growing popularity of Swedish detective fiction in print, on television and on the cinema screen is based on only a few well-known names; its history, however, is much longer and richer than is generally understood. Bergman, Kerstin and Sara Kärrholm. Kriminallitteratur (Crime Literature). Lund: Studentlitteratur, 2011. Crace, John. “Move over, Ian Rankin”. The Guardian, 23 January 2009. Peacock, Steven. Swedish Crime Fiction: Novel, Film, Television. Manchester: Manchester University Press, 2014. Jane Mattisson Ekstam is an Associate Professor of English at Kristianstad University, Sweden. Expansive and exciting dissertations can undoubtedly be written on the theme of Scandinavian crime fiction, or Scandi noir (Nordic noir) as it is sometimes referred to. To be sure, much ink has been spilled on the issues of fem crime (a Scandinavian term for “sisters in crime” that doesn’t translate exactly), American-created hardboiled tales, whodunits, and all the other wonderful subsets of the wildly popular genre. At the end of the day, we all (at least we readers of Mystery Readers Journal) love our crime fiction. I have harbored and been fostering a passionate relationship with crime literature ever since I was a child and I listened, with rapt attention, to the stories my mother shared with me; ever since I first read Enid Blyton’s Famous Five; ever since I discovered I was pretty good at imagining things. Nature equipped me with a terrible curiosity, a murderous fantasy world, a healthy dose of empathy, and a burning desire to investigate human relationships. Especially, that is, when they go awry, or when there is far more at stake than simply the color of wallpaper. It seems I was meant to tell crime stories. Now, nine books into the Louise Rick and Camilla Lind book series, I find myself, as I was at the start, still being boxed into various sub-genres. My books are always categorized as fem crime by those who believe that it takes a woman to write them, because a female central character/ protagonist is essential to the story. Those who believe that it is the geographical setting that is imperative call them Scandi crime, and, to be fair, my books are rightfully labeled “police crime,” as they revolve around police work and the solving of crimes. They are called whatever it takes to fit them in these boxes. And, that is all right, I suppose. In fact, they are made up of a bit of everything (a pinch of this, a touch of that), but most importantly, they are good stories about extraordinarily ordinary people, and the kinds of problems and challenges that we all meet up with in our lives; the kinds of challenges that might result in fatal consequences. They are Sara Blædel books, and they are always deeply about something; any topic that interests me, that I believe to be important; any topic that I have chosen because it stirs and provokes in me a sense of social indignation. That is how things often work in Scandi crime, and therefore I cannot deny (and I wouldn’t anyway) my heritage and the cultural background from which my writing and I originate. Relationships and the opportunities (or lack thereof) that people have are subjects that have always consumed me. Over the years, I have explored numerous timely topics, among them prostitution, Internet dating, drug abuse, peer pressure, and assisted suicide. In The Forgotten Girls, which was published by Grand Central in the United States on the 3rd of February, the storytelling plays out in the historical setting of an all-girls home, where unwanted female children were once abandoned. Fifty years ago, it was customary for local authorities to look after kids, who, for one reason or another, could not get the care they were entitled to from their own families. When the girls registered at the orphanage, parents were asked to forget that they’d ever existed. Two of these children, a pair of twins, suddenly appear many years later, long after everybody believes they have already died. There is always a theme within my books that is developed separate to the main story. Parallel to how this theme builds and unfolds, we follow our main character, Louise Rick, and her friend, Camilla Lind. My books tell the stories of how my main characters develop. We learn about their relationships and back-stories, and how they’ve evolved. Louise and Camilla are one another’s families by choice. We follow them at work, and we learn about their sons and spouses. We watch them navigate through Copenhagen and the suburbs where they both grew up (as I did myself), out in the countryside fifty kilometers away, in an area with large forests, fjords, and villages. A region with an ancient history and a thousand-year-old mythology. We get to witness police work and the solving of crimes in this setting, way up close. Knowing how authentic police procedure transpires is important to me. I engage, diligently, in research of the factual elements of my stories; this is a top priority for me when I write. Scandi crime, historical whodunit, legal thrillers, hardboiled or psychological suspense—as long as the stories draw you in, the characters speak to you, and the plots are as sharp as the edges of knives, I will always love a well-written, intriguing, affecting, and nail-bitingly good crime fiction book. Sara Blædel is the author of the international bestselling series featuring Detective Louise Rick and journalist Camilla Lind. Her books are published in 23 countries. She lives in Copenhagen, and was voted Denmark’s most popular novelist (The Martha Prize) for the fourth time in 2014.